Barclays has announced that it is buying Standard Life Bank, the offshoot of Edinburgh-based life insurance company Standard Life, for £226m. Barclays is one of the biggest banks in the world, with millions of customers, whereas Standard Life Bank is a relative minnow. It has just 287,000 savings accounts and 78,000 mortgage accounts. Standard Life Bank has been operating only since 1998, and the insurer said the sale was in its best interests. "Standard Life has limited the lending activity of Standard Life Bank during the recent economic downturn," said Sir Sandy Crombie, chief executive of Standard Life. The financial crisis has seen some dramatic re-shaping of the bank sector, most of it under crisis conditions or at fire sale prices. This agreement between Barclays and Standard Life doesn't look like it's being driven by either. Both companies have had a turbulent two years, but they've fared relatively well. It is, however, partly a response from the Edinburgh life assurance giant to changes in its method of selling savings and pension products. The Retail Distribution Review is forcing independent financial advisers (IFAs) to earn their living on a fee basis rather than commission - this is to improve the transparency of financial products for customers. Barclays offers huge potential for reaching new customers with Standard Life products, and while the Scottish company insists IFAs will remain a core part of its operations, this reduces its dependence on them. "We no longer believe that increasing the lending activity of the bank is consistent with our long-term financial objectives," he added. 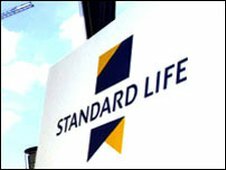 Standard Life demutualised and became a stock market-quoted company in 2006. The deal will go through early next year and 268 staff will transfer jobs. Barclays said that the acquisition of Standard Life Bank was a "good fit" with its existing UK retail banking business. "This transaction brings to Barclays high-quality savings and mortgage books, and an attractive customer base," said Frits Seegers, chief executive of Barclays global retail and commercial banking. The strategic move points to a significant and growing closeness between the two financial firms. This will start with online and phone customers of Barclays Direct being offered a Standard Life Self-Invested Personal Pension (SIPP) product. Standard Life has a workforce of 10,000 worldwide, with 6,000 of them in Edinburgh. It has significant operations in Canada, a presence in Germany, as well as partnerships in India and China.